I think transcribing is a really useful thing to do. I see it as a replacement for not having a body of work to study, like you do if you study classical guitar, classical piano, etc. For example, all classical guitarists will know the Villa-Lobos stuff, Sor, and all the rest of it. If everyone knows that stuff, we can all discuss how to play it well. But there isn’t that kind of canon for rock, blues, jazz and so on. So we learn from listening to other recordings, gigs, jams and we figure it out. Transcribing offers a chance to get stuck into the details, but there are drawbacks. You can end up being cursed by being infected with someone’s nuanced way of playing and that can mask your own voice. So you may have to purge yourself of that, or be content to wear your influences on your sleeve. 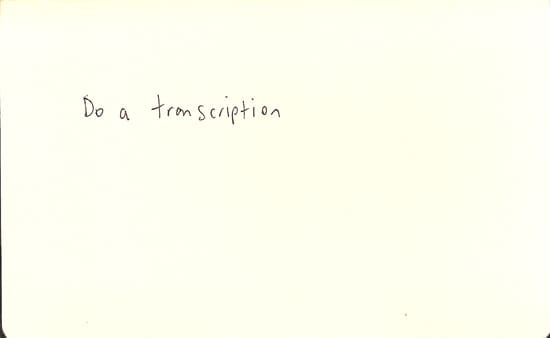 Also, you can transcribe stuff and miss the point of working on YOU. It feels good to play stuff that you know sounds great, so that can be a trap, too. Another trap can be not allowing yourself to be rooted in something for a long time; for something to unfold. That kind of thing you get if you have the canon. You play the Chopin E Minor Prelude all your life – it’s not like you’ll ever get to the end of, ‘right, I know that one now’. Maybe the closest that an improvisor can get to that is to understand what it means to be in the moment, or what it means to tell a story. Always good to hear the gods of music showing us that, eh? So, I’ve gone WAY off topic in this pile of gibberish.